If you are wondering if this is a new model of lorry in Singapore, no, it's not. It's one of the many groups students in the premier university in Singapore (3rd in Asia by the way according to this recent news) building a float for the NUSSU Rag and Flag. NUSSU = National University of Singapore Student Union. Building floats is part of the "Rag" part of the show. Floats and performances by students of the various schools/faculties, staff and alumni will be a presented and the best will be picked. For the "Flag" part, students will collect money to be distributed to charities. Looking at this wiki page, they raise quite a lot of money for charities. If you are free on 6 August 2010, head down to the NUS. 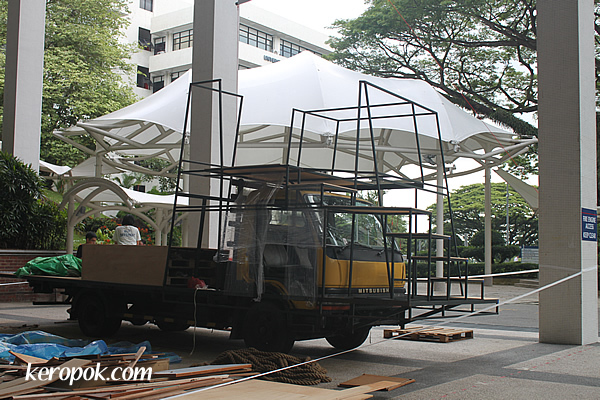 See how the lorry above will be transformed into a beautiful float. The Singapore President will be there! The Singapore Youth Olympic Flame will also make its way there.